McDOWELL'S ADVANCE TO BULL RUN. James B. Fry, Brevet Major-General, U.S.A.
As President Buchanan's administration was drawing to a close, he was forced by the action of the South to decide whether the power of the general Government should be used to coerce into submission States that had attempted to secede from the Union. His opinion was that the contingency was not provided for, that while a State had no right to secede, the Constitution gave no authority to coerce, and that he ha no right to do anything except hold the property and enforce the laws of the United States. Before he went out of office the capital of the nation seemed to be in danger of seizure. For its protection, and in order to consult about holding Southern forts and arsenal, General Scott was in December called to Washington, from which he had been absent since the inauguration of Pierce, who had defeated him for the presidency. Jefferson Davis, Pierce's Secretary of War, and General Scott had quarreled, and the genius of acrimony controlled the correspondence which took place between them. Notwithstanding the fact that on account of his age and infirmities he was soon overwhelmed by the rush of events, General Scott's laurels had not withered at the outbreak of the war, and he brought to the emergency ability, experience, and prestige. A high light in the whole military word, he towered above the rest of our army at that time professionally as he did physically. As the effect of his unusual stature was increased by contracts with a short aide-de-camp (purposely chosen, it was suspected), so was his exalted character marked by one or two conspicuous but not very harmful foibles. With much learning, great military ability, a strict sence of justice, and a kind heart, he was vain and somewhat petulant. He loved the Union and hated Jefferson Davis. By authority of President Buchanan, Scott assembled a small force of regulars in the capital, and for the first time in the history of the country the electoral count was made and a President was inaugurated under the protection of soldiery. But before the inauguration of Lincoln, March 4th, the secession movement had spread through the "cottonbelt" and delegates from the secession States had met as a congress at Montgomery, Alabama, February 4th. On the 8th they had organized the "Provisional Government of the Confederate States of America," and on the 9th had elected Jefferson Davis President and Alexander H. Stephen Vice-President. When the news of the firing upon Sumter reached Washington, President Lincoln prepared a proclamation, and issued in April 15th, convening Congress and calling forth 75,000 three-months militia to suppress combinations against the Government. The Federal situation was alarming. Sumter fell on the 13th of April, and was evacuated on the 14th. Virginia seceded on the 17th, and seized Harper's Ferry on the 18th and the Norfolk Navy Yard on the 20th. On the 19th a mob in Baltimore assaulted the 6th Massachusetts volunteers as it passed through to Washington, and at once bridges were burned and railway communication was cut off between Washington and the North. Lincoln had had no experience as a party leader or executive officer, and was without knowledge of military affairs or acquaintance with military men. Davis at the head of the Confederacy was an experienced and acknowledged Southern leader; he was a graduate of the Military Academy; had commanded a regiment in the Mexican-American War; had been Secretary of War under President Pierce, and had been chairman of the Military Committee in the United States Senate up to the time he left Congress to take part with the South. He was not only well versed in everything relating to war, but was thoroughly informed concerning the character and capacity of prominent and promising officers of the army. There was nothing experimental in his choice of high military commanders. With but few exceptions, those appointed at the beginning retained command until they lost their lives or the war closed. The Southern States, all claiming to be independent republics after secession, with all their governmental machinery, including militia and volunteer organization, in complete working order, transferred themselves as States from the Union to the Confederacy. The organization of a general government from such elements, with war as its immediate purpose, was a simple matter. Davis had only to accept and arrange, according to his ample information and well-matured judgment, the abundant and ambitious material at hand in the way that he thought would best secure his purposes. Lincoln had to adapt the machinery of a conservative old government, some of it unsuitable, some unsound, to sudden demands for which it was not designed. The talents of Simon Cameron, his first Secretary of War, were political, not military. He was a kind, gentle, placid man, gifted with powers to persuade, not to command. Shrewd and skilled in the management of business and personal matters, he had no knowledge of military affairs, and could not give the President much assistance in assembling and organizing for war the earnest and impatient, but unmilitary people of the North. Officers from all departments of the Federal civil service hurried to the Confederacy and placed themselves at the disposal of Davis, and officers from all the corps of the regular army, most of them full of vigor, with the same education and experience as those tow remained, went South and awaited assignment to the duties for which Davis might regard them as best qualified. All Confederate offices were vacant, and the Confederate President had large if not absolute power in filling them. On the other hand, the civil offices under Lincoln were occupied or controlled by party, and in the small regular army of the Union the law required that vacancies should as a rule be filled by seniority. There was no retired list for the disabled, and the army was weighed down by longevity; by venerated traditions; by prerogatives of service rendered in former wars; by the firmly tied red-tape of military bureauism and by the deep-seated and well-founded fear of the auditors and comtrollers of the treasury. Nothing but time and experience-possibly nothing but disaster-could remove from the path of the Union President difficulties from which the Confederate President was, by the situation, quite free. In federates, notwithstanding the greater resources of the North, which produced their effect only as the contest was prolonged. After the firing of the first gun upon Sumter, the two sides were equally active in marshaling their forces on a line along the border States from the Atlantic coast of Virginia in the east to Kansas in the west. Many of the earlier collisions along this line were due rather to special causes or local feeling than to general military considerations. The prompt advance of the Union forces under McClellan to West Virginia was to protect that new-born free State. Patterson's movement to Hagerstown and thence to Harper's Ferry was to prevent Maryland from joining or aiding the rebellion, to re-open the Baltimore and Ohio railroad, and prevent invasion from the Shenandoah Valley. The Southerners having left the Union and set up the Confederacy upon the principle of State rights, in violation of that principle invaded the State of Kentucky in opposition to her apparent purpose o armed neutrality. That made Kentucky a field of early hostilities and helped to anchor her to the Union. Missouri was rescued from secession through the energy of General F. P. Blair and her other Union men, and by the indomitable will of Captain Lyon of the regular army, whose great work was accomplished under many disadvantages. In illustration of the difficulty with which the new condition of affairs penetrated the case-hardened bureauism of long peace, it may be mentioned that the venerable adjutant-general of the army, when a crisis was at hand in Missouri, came from a consultation with the President and Secretary Cameron, and with a sorry expression of countenance and an ominous shake of the head exclaimed, "It's bad, very bad; we're giving that young man Lyon a great deal too much power in Missouri." Early in the contest another young Union officer came to the front. Major Irvin McDowell was appointed brigadier-general May 14th. He was forty-three years of age, of unexceptionable habits and great physical powers. His education, begun in France, was continued at the United States Military Academy, from which he was graduated in 1863. Always a close student, he was well informed outside as well as inside his profession. Distinguished in the Mexican war, intensely Union, in his sentiments, full of energy and patriotism, outspoken in his opinions, highly esteemed by General Scott, on whose staff he had served, he at once secured the confidence of the President and the Secretary of War, under whose observation he was serving in Washington. Without political antecedents or acquaintances, he was chosen for advancement on account of his record, his ability, and his vigor. By the 1st of June the Southern Government had been transferred from Montgomery to Richmond, and the capitals of the Union and of the Confederacy stood defiantly confronting each other. General Scott was in chief command of the Union forces, with McDowell south of the Potomac, confronted by his old classmate, Beauregard, hot from the capture of Fort Sumter. 1 The aspect of affairs was so threatening after President Lincoln's call of April 15th for 75,000 three-months militia, and General Scott was so averse to undertaking any active operations with such short-term troops, that, as early as May 3d, and without waiting for the meeting of Congress, the President entered upon the creation of an additional volunteer army to be composed of 42,034, three-years men, together with an increase of 22,714 regulars and 18,000 seamen. - J. B. F.
General Patterson, of Pennsylvania, a veteran of the war of 1812 and the war with Mexico, was in command near Harper's Ferry, opposed by General Joseph E. Johnston. The Confederate President, Davis, then in Richmond, with General R. E. Lee as military advised in persons general military control of the Southern forces. The enemy to be engaged by McDowell occupied what was called the "Alexandria line," with headquarters at Manassas, the junction of the Orange and Alexandria with the Manassas Gap railroad. The stream known as bull Run, some three miles in front of Manassas, was the line of defense. On Beauregard's right, 30 miles away, at the mouth of Aquia Creek, there was a Confederate brigade of 3000 men and 6 guns under General Holmes. The approach to Richmond from the Lower Chesapeake, threatened by General B. F. Bulter, was guarded by Confederates under Generals Huger and Magruder. On Beauregard's left, sixty miles distant, in the Lower Shenandoah Valley and separated from him by the Blue Ridge Mountains, was the Confederate army of the Shenandoah under command of General Johnston. Beauregard's authority did not extend over the forces of Johnston, Huger, Magruder, or Holmes, but Holmes was with him before the battle of Bull Run, and so was Johnston, who as will appear more fully hereafter, joined at a decisive moment. "Believing the chances are greatly in favor of the enemy's accepting battle between this and the Junction and that the consequences of that battle will be of the greatest importance to the country, as establishing the prestige in the contest, on the one side or that other,-the more so as the two sections will be fairly represented by regiments from almost every State,- I think it of great consequence that, as for the most part our regiments are exceedingly raw and the best of them, with few exceptions, not over steady in line, they be organized into as many small fixed brigades as the number of regular colonels will admit, . . . so that that the men may have as fair a chance as the nature of things and the comparative inexperience of most will allow." 2 Beauregard himself has said that on the 18th of July he had along the line of Bull Run about 17,000 men; that on the 19th General Holmes joined him with about 3000 men; and that he "received from Richmond between the 18th and 21st about 2000 more"; and that Johnston brought about 8000 more, the advance arriving "on the morning of the 20th and the remainder about noon of the 21st," making his whole force, as he states it, "nearly 30,000 men of all arms." The figures are probably under the mark, as Hampton's Legion, McRea's regiment, a North Carolina "regiment and two battalions of Mississippi and Alabama" joined between the 17th and 21st. Beauregard's force may fairly be placed at 32,000; and the opposing armies, both in the aggregate and in the parts engaged, wee nearer equal in that than in any other battle in Virginia.- J. B. F.
There was an ill-suppressed feeling of sympathy with the Confederacy in the Southern element of Washington society; but the halls of Congress resounded with the eloquence of Union speakers. Martial music filled the air, and war was the tropic whether men met. By day and night the tramp of soldiers was heard, and staff-officers and orderlies galloped through the streets between the headquarters of Generals Scott and McDowell. Northern enthusiasm was unbounded. "On to Richmond" was the war-cry. Public sentiment was irresistible, and in response to it the army advanced. It was a glorious spectacle. The various regiments were brilliantly uniformed according to the aesthetic taste of peace, and the silken banners they flung to the breeze were unsoiled and untorn. The bitter realities of war were nearer than we knew. 3 The average length of service of McDowel's men prior to the battle was about sixty days. The longest in service were the three-months men, and of these he had fourteen regiments. - J. B. F.
4 The state of General Beauregard's mind at the time is indicated by the following telegram on the 17th of July from him to Jefferson Davis: "The enemy has assaulted my outpost in heavy force. I have fallen back on the line of Bull Run and will make a stand at Mitchell's Ford. If his force is overwhelming, I was to retire to Rappahannock railroad bridge, saving my command for defense there and future operations. Please inform Johnston of this via Staunton, and also Holmes. Send forward any reinforcements at the earliest possible instant and by every possible means." The alarm in this dispatch and the apprehension it shows of McDowell's "overwhelming" strength are not in harmony with the more recent assurance of the Confederate commander, that through sources in Washington treasonable to the Union, and in other ways, he "was almost as well informed of the strength of the hostile army in my [his] front as its commander." - J. B. F.
McDowell was compelled to wait at Centerville until his provision wagons arrived and could issue rations. His orders having carried his leading division under Tyler no father than Centerville, he wrote that officer at 8:15 A. M. on the 18th, "Observe well the roads to Bull Run and to Warrenton. Do not bring on an engagement, but keep up the impression that we are moving on Manassas." McDowell then went to the extreme left of his line to examine the country with reference to a sudden movement of the army to turn the enemy's right flank. The reconnaissance showed him that the country was unfavorable to the movement, and he abandoned it. While he was gone to the left, Tyler, presumably to "keep up the impression that we were moving on Manassas," went forward from Centerville with a squadron of cavalry and two companies of infantry for the purpose of making a reconnaissance of Mitchell's and Blackburn's fords along the direct road to Manassas. The force of the enemy at these fords has just been given. Reaching the crest of the ridge overlooking the valley of Bull Run and a mile or so from the stream, the enemy was seen on the opposite bank, and Tyler brought up Benjamin's artillery, 2 20-pounders rifled guns, Ayres's field battery of 6 guns, and Richardson's brigade of infantry. The 20-pounders opened from the ridge and a few shots were exchanged with the enemy's batteries. Desiring more information than the long-range cannonade afforded, Tyler ordered Richardson's brigade and a section of Ayres' battery, supported by a squadron of cavalry, to move from the ridge across the open bottom of Bull run and take position near the stream and have skirmishers "scour the thick woods" which skirted it. Two regiments of infantry, 2 pieces of artillery, and a squadron of cavalry moved down the slope into the woods and opened fire, driving bonham's outpost to the cover of intrenchments across the steam. The brigades of Bonham and Longstreet, the latter being reenforced of the occasion by Early's brigade, responded at short range to the fire of the Federal reconnoitering force and drove it back in disorder. Tyler reported that having satisfied himself "that the enemy was in force," and ascertained "the position of his batteries," he withdrew. 5 This unauthorized reconnaissance, called by the Federals the affairs at Blackburn's Ford, was regarded at the time by the Confederates as a serious attack, and was dignified by the name of the "battle of Bull Run," the engagement of the 21st being called by them the battle of Manassas. The Confederates, feeling that they had repulsed a heavy and real attack, were encouraged by the result. The Federal troops, on the other hand, were greatly depressed. The regiment which suffered most was completely demoralized, and McDowell thought that the depression of the repulse was felt throughout his army and produced its effect upon the Pennsylvania regiment and the New York battery which insisted (their terms having expired) upon their discharge, and on the 21st, as he expressed it, "marched to the rear to the sound of the enemy's cannon." Even Tyler himself felt the depressing effected of his repulse, if we may judge by his cautions and feeble action on the 21st when dash was required. 5 The casualties in the affair were; Union, 1 officer and 18 enlisted men killed; 1 officer and 37 enlisted men wounded; 26 enlisted men missing,- aggregate, 83. Confederate (Beauregard in his official report of 1861), "15 killed and 53 wounded men, several of whom have since died." - J. B. J.
the haversacks of his men were empty, and had to be replenished from the provision wagons, which were late in getting up. Nor had he yet determined upon his point or plan of attack. While resting and provisioning his men, he devoted the 19th and 20th to a careful examination by his engineers of the enemy's position and the intervening country. His men, not soldiers, but civilians in uniform, unused to marching, hot, weary, and footsore, dropped down as they had halted and bivouacked on the roads about Centreville. Notwithstanding Beauregard's elation over the affairs at Blackburn's Ford on the 18th, he permitted the 19th and 20th to pass without a movement to follow up the advantage he had gained. During these two days, McDowell carefully examined the Confederate position, and made his plan to manoeuver the enemy out of it. Beauregard ordered no aggressive movement until the 21st, and then, as appears from his own statement, through miscarriage of orders and lack of apprehension on the part of subordinates, the effort was a complete fiasco, with the comical result of frightening his own troops, who, late in the afternoon mistook the return of one of their brigades for an attack by McDowell's left, and the serious result of interfering with the pursuit after he had gained the battle of the 21st. But Beauregard, though not aggressive on the 19th and 20th, was not idle within own lines. The Confederate President had authorized Johnston, Beauregard's senior, to use his discretion in moving to the support of Manassas, and Beauregard, urging Johnston to do so, sent railway transportation for the Shenandoah forces. But, as he states, "he at the same time submitted the alternative proposition to Johnston that having passed the Blue Ridge, he should assemble his forces, press forward by way of Aldie, north-west of Manassas, and fall upon McDowell's right rear," while he, Beauregard, "prepared for the operation at the first sound of the conflict, should strenuously assume the offensive in front." "The situation and circumstances specially favored the signal success of such an operation," says Beauregard. An attack by two armies moving from opposite points upon an enemy, with the time to attack for one depending upon the sound of the other's cannon, is hazardous even with well-disciplined and well-seasoned troops, and is next to fatal with raw levies. Johnston chose the wiser course of moving by rail to Manassas, thus preserving the benefit of "interior lines," which, Beauregard says, was the "sole military advantage at the moment that the Confederate possessed." 6 On the 17th of July Patterson, with some 16,000 three-months men, whose terms began to expire on the 24th, was at Charleston, and Johnson, with about the same number, was at Winchester. On that day General Scott telegraphed Patterson, "McDowell's first work has driven the enemy behind Fairfax Court House. Do not let the enemy amuse and delay you with a small force in front while he reenforces the Junction with his main body." To this Patterson replied at half-past 1 o'clock in the morning of the 18th, stating his difficulties and asking, "Shall I attack ?" General Scott answered on the same day: "I have certainly been expecting you to beat the enemy," or that you "at least had occupied him by threats and demonstrations. You have been at least his equal and I suppose superior in numbers. Has he not stolen a march and sent reinforcements towards Manassas Junction?" Patterson replied on the same day (18th), "The enemy has stolen no march upon me. I have caused him to be reenforced"; and at 1 o'clock P. M. on that day he added: "I have succeeded, in accordance with the wished of the General in Chief, in keeping General Johnston's force at Winchester." At the very hour that Patterson at Winchester." At the very hour that Patterson was writing this dispatch Johnston's advance was leaving Winchester. On the 18th Johnston telegraphed to Richmond that Patterson was at Charleston, and said: "Unless he prevents it, we shall move toward General Beauregard to-day." He moved accordingly, and the Confederate armies were united for battle. It rested, however, with higher authority than Patterson to establish between his army and McDowell's the relations that the occasion called for. In considering the requirements for McDowell's movement against Manassas, General Scott gave great weight to the general and irresistible fear then prevailing in Washington that the capital might be seized by a dash. Its direct defence was the first purpose of the three months militia. The Potomac at Washington was itself a strong barrier, and with the field-works on its south bank afforded security in that quarter. The danger was thought to be from the Shenandoah, and that induced the Government to keep Patterson in the valley. Indeed, on the 30th, of June Colonel C. P. Stone's command was ordered from Point of Rocks to Patterson at Martinsburg, where it arrived on the 8th of July; whereas the offensive campaign against Manassas, ordered soon after, required Patterson to go to Stone, as he proposed to do June 21st, instead of Stone to Patterson. The campaign of McDowell was forced upon General Scott by public opinion, but did not relieve the authorities from the fear that Johnston might rush down and seize Washington. General Scott, under the pressure of the offensive, in one quarter and the defensive in another, imposed upon Patterson the double task, difficult if not impossible, of preventing Johnston from moving on the capital and from joining Beauregard. If that task was possible, it could have been accomplished only by persistent fighting, and that General Scott was unwilling to order; though in his dispatch of the 18th in reply to Pattersons' question, "Shall I attack?" he said, "I have certainly been expecting you to beat the enemy." Prior to that, his instructions to Patterson had enjoined caution. As soon as McDowell advanced, Patterson was upon an exterior line and in a false military position. Admitting that he might have done more to detain Johnston, had strategy was probably more to blame for the result than any action or lack of action on Patterson's part.- J. B. F.
During the 19th and 29th the bivouac of McDowell's army at Centerville, almost within cannon range of the enemy, were thronged by visitors, official and unofficial, who in carriage from Washington, bringing their own supplies. They were under no military restraint, and passed to and from among the troops as they pleased, giving the scene the appearance of a monster military picnic. 7 Among others, the venerable Secretary of War, Cameron, called upon McDowell. Whether due to a naturally serious expression, to a sense of responsibility, to a promotion of the fate of his brother who fell upon the field on the 21st, or to other cause, his countenance showed apprehension of evil; but men generally were confident and jovial. 7 The presence of senators, congressmen, and other civilians upon the field on the 21st gave rise to extravagant and absurd stories, in which alleged forethought and valor among them are contrasted with a lack of these qualities in the troops. The plain truth is that the non-combatants and their vehicles merely increased the confusion and demoralization of the retreat.- J. B. F.
remain in reserve at Centerville, prepare defensive works there and threaten Blackburn's Ford. Tyler's First Division, which was on the turnpike in advance, was to move at 2:30 A. M., threaten the Stone Bridge and open fire upon it at daybreak. This demonstration was to be vigorous, its first purpose being to divert attention from the movements of the turning column. As soon as Tyler troops cleared the way, Hunter's Second Division, followed by Heitzelman's Third Division, was to move to a point on the Warrenton Turnpike about 1 or 2 miles east of Stone Bridge and there take a country road to the right, cross the Run at Sudley Springs, come down upon the flank and rear of the enemy at the Stone Bridge, and force him to open the way for Tyler's division to cross there and attack, fresh and in full force. 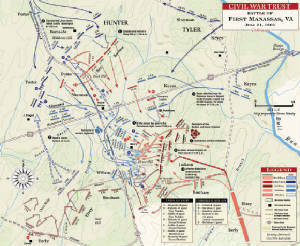 Tyler's start was so late and his advance was so slow as to hold Hunter and Heitzelman 2 or 3 hours on the mile or to of the turnpike between their camps and the point at which they were to turn off for the flank march. This delay, and the fact that the flank march proved difficult and some 12 miles instead of about 6 as was expected, were of serious moment. The flanking column did not cross at Sudley Springs until 9:30 instead of 7, the long march, with its many interruptions, tired out the men, and the delay march, with its many interruptions, tired out the men, and the delay gave the enemy time to discover the turning movement. Tyler's operations against the Stone Bridge were feeble and ineffective. By 8 o'clock Evans was satisfied that he was in no danger in front, and perceived the movement to turn his position. He was on the left of the Confederate line, guarding the point where the Warrenton Turnpike, the great highway to the field, crossed Bull Run, the Confederate line of defense. He had no instructions to guide him in the emergency that had arisen. But he did not hesitate. Reporting his information and purpose to the adjoining commander, Cocke, and leaving 4 companies of infantry to deceive and hold Tyler at the bridge, Evans before 9 o'clock turned his back upon the point he was set to guard, marched a mile away, and, seizing the high ground to the north of Young's, Branch of Bull Run, formed line of battle at right angles to his former line his left resting near the Sudley Springs road, by which Burnside with the head of the turning column was approaching, thus the Warrenton Turnpike and opposing a determined from to the Federal advance upon the Confederate left and rear. 8 In his rear to the south lay the valley of Young's Branch, and rising from that was the higher ridge of plateau on which the Robinson house and the Henry house were situated, and on which the main action took place in the afternoon. Burnside, finding Evans across his path, promptly formed line of battle and attacked about 9:45 A. M. Hunter, the division commander, who was at the head at Burnside's brigade directing the formation of the first skirmish line, was severely wounded and taken to the rear at the opening of the action. Evans not only repulsed but pursued the troops that made the attack upon him. Andrew Porter's brigade of Hunter's division followed Burnside closely and came to his support. In the mean time Bee had formed a Confederate line of the battle with his and Bartow's brigades of Johnston's army on the Henry house plateau, a stronger position than the one held by Evans, and desired Evans to fall back to that line; but Evans, probably feeling bound to cover the Warrenton Turnpike and hold it against Tyler as well as against the flanking column, insisted that Bee should move across the valley to his support, which was done. After Bee joined Evans, the preliminary battle continued to rage upon the ground chosen by the latter. The opposing forces were Burnside's and Proper brigades, with one regiment of Heintzelman's Federal side, and Evan's, Bee's, and Bartow's brigades on the Confederate side. The Confederates were dislodged and driven back to the Henry house plateau, where Bee had previously formed line and where what Beauregard called "the mingled of Bee's, Bartow's, and Evans's commands" were re-formed under cover of Stonewall Jackson's brigade to Johnston's army. 8 Evans's action was probably one of the best pieces of soldiership on either side during the campaign, but it seems to have received no special commendation from his superiors. - J. B. F.
The time of this repulse, as proved by so accurate an authority as Stonewall Jackson, was before 11:30 A. M., and this is substantially confirmed by Beauregard's official report made at the time. Sherman and Keyes had nothing to do with it. They did not begin to cross Bull Run until noon. Thus, after nearly two hours' stubborn fighting with the forces of Johnston, which General Scott had promised should be kept away, McDowell won the first advantage; but Johnston had cost him dearly. During all this time Johnston and Beauregard had been waiting near Mitchell's Ford for the development of the attack they had ordered by their right upon McDowell at Centerville. The gravity of the situation upon their left had not yet dawned upon them. What might the result have been if the Union column, had not been detained by Tyler's delay in moving out in the early morning, or if Johnston's army, to which Bee, Bartow, and Jackson belonged, had not arrived? 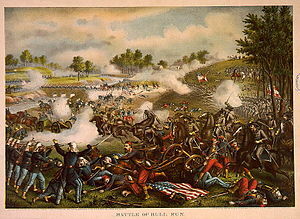 9 After the affair at Blackburn's Ford on the 18th and Tyler's action in the battle of the 21st, a bitterness between Tyler and McDowell grew up which lasted till they died. As late as 1884, McDowell, writing to me of Tyler's criticism of him after the war, said, "How I have been punished for my leniency to that man! If there is anything clearer to me that anything else with reference to our operations in that campaign, it is that if we had another commander for our right we should have had a complete and brilliant success." - J. B. F.
on the field and joined in the pursuit of Bee's forces across the valley of Young's Branch. Keyes's brigade, accompanied by Tyler in person, followed companies by Tyler in person, followed across the steam where Sherman forded, but without uniting with the other forces on the field, made a feeble advance upon the slope of the plateau toward the Robinson house, and then about 2 o'clock filed off by flank to its left and, sheltered by the east front of the bluff that forms the plateau, marched down Young's Branch out of sight of the enemy and took no further part in the engagement. McDowell did not know where it was, nor did he then know that Schenck's brigade of Tyler's division did not cross the Run at all. The line taken up by Stonewall Jackson upon which Bee, Bartow, and Evans rallied on the southern part of the plateau was a very strong one. The ground was high and afforded the cover of a curvilinear wood with the concave side toward the Federal line cover of a curvilinear wood with the concave side toward the Federal line of attack. According to Beauregard's official report made at the time, he had upon this part of the field, at the beginning, 6500 infantry, 13 pieces of artillery, and 2 companies of cavalry, and this line was continuously reenforced from Beauregard's own reserved and by the arrival of the troops from the Shenandoah Valley. 10 Griffin himself told me so as we rode together after leaving Centerville. He and I were classmates and warm friends. -J. B. F.
"Returning to the position occupied by Rickett's and Griffin's batteries, I received an order from General McDowell to advance two batteries to on eminence [the Henry Hill] specially designated by him, about eight hundred yards in front of the line previously occupied by our artillery, and very near the position first occupied by the enemy's batteries. I therefore ordered these two batteries to move forward at once, and, as soon as they were in motion, went for and procured as supports the 11th (Fire Zouaves) and the 14th (Brooklyn) New York regiment. I accompanied the former regiment to guide it to its proper position, and Colonel Heintzelman, 17th U. S. Infantry, performed the same service for the 14th, on the right of the 11th. A squadron of United States cavalry under Captain Colburn, 1st Cavalry, was subsequently ordered as additional support. We were soon upon the ground designated, and the two batteries at once opened a very effective fire upon the enemy's left. The new position had scarcely been occupied when a troop of the enemy's cavalry, debouching from a piece of woods close upon our right flank, charged down upon the New York 11th. the Zouaves, catching sight of the cavalry a few moments they were upon them, broke ranks to such a degree that the cavalry dashed through without doing them much harm. the Zouaves gave them a scattering fire as they passed, which emptied five saddles and killed three horses. A few minutes afterward a regiment of the enemy's infantry, covered by a high fence, persecuted itself in line on the left and front of the two batteries at not more than sixty or seventy yards' distance, and delivered a volley full upon the batteries and their support. Lieutenant Ramsay, 1st Artillery, was killed, and Captain Ricketts, 1st Artillery, was wounded, and a number of men and horses were killed or disabled by this close and well-directed volley. The 11th and 14th regiments instantly broke and fled in confusion to the rear, and in spite the repeated and earnest efforts of Colonel Heinzelman with the latter, and myself with the former, refused to rally and return to the support of the batteries. The enemy seeing the guns thus abandoned by their supports, rushed upon them, and driving off the cannoneers, who, with their officers, stood bravely at their posts until the last moment, captured them, ten in number. These were the only guns taken by the enemy on the field." EDITORS. I rode back to where I knew Burnside's brigade was at rest, and stated to Burnside the condition of affairs, with the suggestion that he form and move his brigade to the front. Returning, I again met Barnard, and as the battle seemed to him and me to be going against us, and not knowing where McDowell was, with the concurrence of Barnard, as stated in his official report, I immediately sent a note to Miles, telling him to move two brigades of his reserve up to the Stone Bridge and telegraph to Washington to send forward all the troops that could be spared. 11 I left the field with General Franklin. His brigade had dissolved. We moved first northerly, crossed Bull Run below Sudley Spring Ford, and the bore south and east. Learning by inquiries of the men I passed that McDowell was ahead of me, I left Franklin and hurried on to Centerville, where I found McDowell's just after sunset, rearranging the positions of his reserves. - J. B. F.
as the men pleased away from the scene of action. There was no pursuit, and the march from Centerville was as barren of opportunities for the rear-guard as the withdraw from the field of battle had been.12 When McDowell reached Fairfax Court House in the night, he was in communication with Washington and exchanged telegrams with General Scott, in one of which the old hero said, "We are not discouraged"; but that dispatch did not lighten the gloom in which it was received. McDowell was so tired that while sitting on the ground writing a dispatch he fell asleep, pencil in hand, in the middle of a sentence. His adjutant-general aroused him; the dispatch was finished, and the weary ride to the Potomac resumed. When the unfortunate commander dismounted at Arlington next forenoon in a soaking rain, after 32 hours in the saddle, his disastrous campaign of 6 days was closed. The first martial effervescence of the country was over. The three-months men went home, and the three-months chapter of the war ended- with the South triumphant and confident; the North disappointed but determined. 12 The revised losses are as follows: Federal, 16 officers and 444 enlisted men killed; 78 officers and 1046 enlisted men wounded; 50 officers and 1262 enlisted men missing; 25 pieces of artillery and a large quantity of small arm. Confederate, 25 officers and 362 enlisted men killed; 63 officers and 1519 enlisted wounded; 1 officer and 12 enlisted men missing. - J. B. F.